Hi! First time posting to LJ, but been a spectator for over a year. Always inspired by the work I see here. Finally got up the stones to post something I was proud of. This is a stitching pony, made for a buddy who is a leatherworking enthusiast. You sit on it, (hence the soft curves for the underside of the thigh, hand cut with a spokeshave); with the clamp sticking up between your legs, which holds your project (a wallet for example) at chest height in front of you so you have both hands free for stitching. It’s made from Sapele, with all brass hardware. The box joints, one made loose to function as a hinge, the other snug and glued firm. Finished with three coats of the Maloof Poly, and two coats of his Wax. Plenty of things I would do differently on the next go around, but thanks for taking a gander. I look forward to the communities thoughts and tips! That’s a very nice, furniture quality, stitching pony. I’m certain your friend will think of you often, while using it. Handsomely crafted. I would like to see a photo of your friend using it as it looks to be a very useful tool. Welcome and nice work. My buddy uses one of those and it dose not look nearly as nice as yours! Nice work and welcome to Lumberjocks. Almost too pretty to use, but I’m sure it will make hand stitching more enjoyable. Besides, it beats the heck out of my Tandy, plain Jane model. Your friend is very lucky! Nice. Beautiful finish. I bought some of the Maloof poly after seeing some good reviews. How high a grit do you sand to? That is some nice craftsmanship. Wish I had that kind of skill with my spokeshaves. Matt Stauffer: I sanded down to 220 before putting down any finish. Then I got a little lazy and only buffed in between the Poly & Wax coats with a #000 steel wool, not the #0000 that’s recommended. bobasaurus: Spokeshave was surprisingly forgiving; it removed the material so slowly it was hard to make a mistake that you can’t carve out with a little elbow grease! As requested here’s a shot of it in use. I’ve asked him to have his wife snap a pic of him with it to show better how it’s oriented while in use. Beautiful pony, really love it. That is really nice work. I do leather work and I must say your pony is much better then the one’s you can purchase from leather supply sites, like Tandy Leather. If you are into making the ones that are attached to a stool, let me know. I would be interested in buying one. What would charge for the one you made? Are you still making these? This is what i’m looking for! 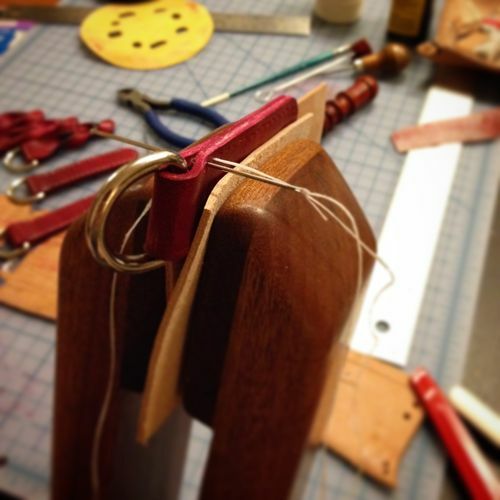 I like the seated stitching pony. But the one I have jaws that are flat and I can’t do bigger items. Please let me know if you are still making these and if you’d consider making me one. I’m in New Zealand and keen to get something worthwhile.